Vada's Blog Stamp Inks and Paper : Paper Piecing and Faux Designer Paper. Our list Mom, (Shar) over at Gingersnaps Creations started posting some beautiful “Paper Piecing” projects that I could not resist. Faux Designer Paper. 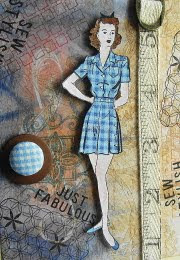 My stamps are from; Hero Arts and Stampin’ Up. Labels: Gingersnap Creations Challenge, Hero Arts., Stampin" Up. Just Fabulous is so right! 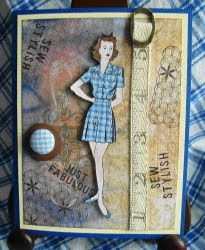 Love the vintage beauty in your card! Oh I get a vintage feel from this Vada. I came by from Gingersnap Creations Yahoo group. Love seeing all the lovely artwork. This I really love. Looks wonderful! The covered button is a fabulous detail! Beautiful card! I love all the sewing elements. Vada, it is wonderful! I love the vintage colors and feel of this card. The embellishments are perfect! 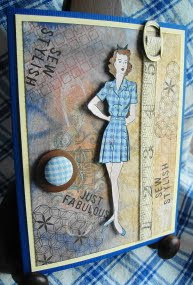 This card has a wonderful vintage feel, the paper piecing elements are wonderful.